The Stern Report draws some alarming conclusions from the growing scientific consensus that global warming is a fact and is caused by greenhouse gas emissions arising as a result of industrial and other man-made processes. The Report demands an immediate and effective response from governments around the world. It also prompts a prior question. 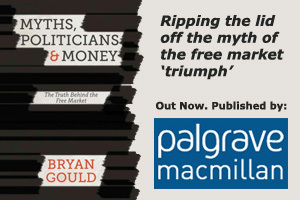 Why has the free market – so often hymned as infallible by right-wing economists – allowed this situation to arise? And why have governments not intervened before now to protect us against this extreme example of market failure? As I point out in The Democracy Sham, the world economy is now controlled by a small number of highly ideological and self-interested power players who are prefectly prepared to put that self-interest ahead of the health of the planet itself. They are able to treat any cost that does not arise directly – in terms of the bottom line – as “externalised” – that is, to be borne by someone else or, in many cases, by no one at all. Environmental costs fall clearly into this category. Their existence is either denied altogether, as in the case of global warming, or lip service is paid to dealing with them. Governments, other agencies and individuals who dare to take a different view are told that if they do not like it, the economic activity at issue will simply be moved somewhere else. A prime example of the impotence of governments, when faced with this kind of blackmail in tlhe global economy, arose recently in New Zealand. The New Zealand government has signed the Kyoto Protocol and proposed a carbon tax as a means of helping to meet its Kyoto commitments. They were promptly told by Comalco, the multinational aluminium smelters, who are major users of electricity, that a carbon tax would mean that they would move their plant elsewhere. The government abandoned the carbon tax and is left for the time being without any credible means of bringing about a significant reduction in emissions. Global warming, in other words, is just the latest and highest-profile example of the heavy price we pay for conceding control of the world economy to a “free market” in which a handful of operators can hold the rest of the world to ransom. It is time, in the interests of us all and of the planet, to re-establish political and democratic control over the economic process.